Mark Knopfler’s guitar sound on the first two Dire Straits albums is firmly associated to the 1 & 2 position (bridge & middle) of the 5-way switch. This position causes a special, nasal “out of phase” sound. The term out of phase is technically incorrect as both pickups are still in phase but – similar to a true out of phase wiring – certain frequencies are cancelled or at least decreased and others boosted so that the resulting sound of both pickups together is totally different from the sound of a single pickup. 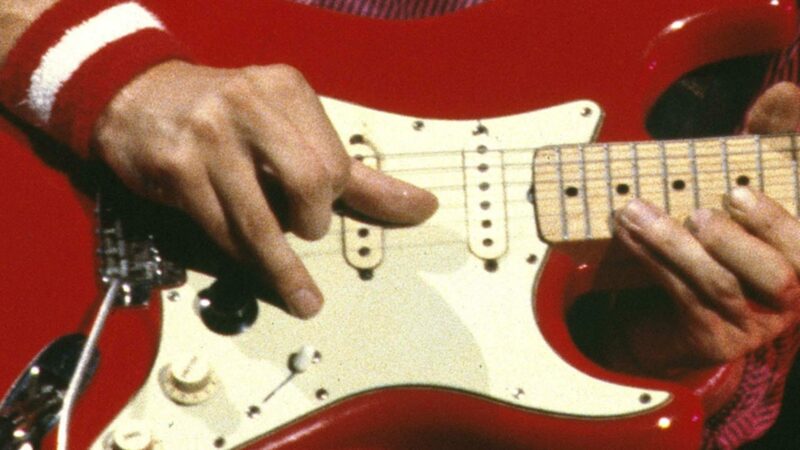 In one of his two red Fender Strats Mark had a DiMarzio FS-1 pickup (confirmed in a Guitar Player interview from early 1979). He often swapped the pickguards of his two Strats at this time, so the one with the DiMarzion was found on both his rosewood and maple neck Strat. This DiMarzio pickup can be heard in the neck position on countless bootleg live recordings of the original Dire Straits setup. It has a louder, warmer and fatter sound which on stage Mark played on songs like Single Handed Sailor, Once Upon a Time in the West (only live versions), Follow me Home (live), or sometimes on Wild West End (live). He also liked to switch to the hotter FS-1 sound just for the solo, e.g. on Sultans of Swing (live in late 1978), or Where Do You Think You’re Going. Both the stock vintage Fender pickups and the DiMarzio FS-1 have staggered pole pieces (the stagger on the FS-1 is a bit different), for this reason they are hard to distinguish on pictures. 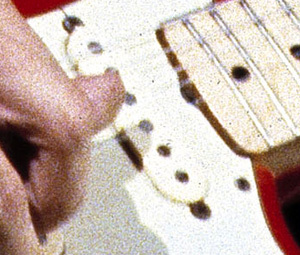 However, the pole pieces of the FS-1 – then in 1978 being rather new compared to his 1961 Fender pickups – are shinier than the old corroded Fender pickups. I recently was watching a picture (below) of Mark’s maple neck Strat from early 1978 (backstage at the Marquee club). The guitar had the pickguard that came of his 1961 rosewood Strat (the one that often had a black volume knob), the pickguard normally with the DiMarzio. I clearly had the impression that there is a stock Fender pickup (with corroded, slightly bevelled pole pieces) in the neck position. Instead, the middle pickup looks much newer and might be the FS-1. The DiMarzio FS-1 in the middle? The picture quality is too bad to be a real proof but at least it is a hint. When thinking about it I realized that on all the live recordings with this pickguard from that time (Chester, Birmingham, London BBC, Revolver TV, Greenwich rehearsals) there is not one single example where Mark plays the neck pickup (!). All 1978 concerts on which he plays the neck pickup (in fact astonishingly often) are after October 1978 (Hamburg, Amsterdam, Paris Chorus TV) , just after his 1961 was refinished to red. So I assume the DiMarzio moved into the neck position at the break when the 1961 Strat was refinished. OK, no neck pickup on the summer 1978 gigs. So the next question was, can we hear the middle pickup alone on any recording from that period? If it was the FS-1, the sound should be fatter than normally. If not, it might have been a stock Fender pickup in the middle, and the FS-1 was purchased in late 1978. A song that normally was played with the middle pickup (compare e.g. the Rockpalast video from 1979) was What’s the Matter with you, Baby. And in fact, there is an ultra-fat middle pickup sound on this song on the recording from Birmimgham, Barbarellas club ( July 4, 1978). The only other existing recording with this song from this period is the one from London (“Live at the BBC” CD). On this concert the guitar sound is extremely bright. What’s the Matter with you, Baby was also played but does not seem as fat as on the Barbarellas gig. But when a/b compared with the other songs it becomes clear that it is the middle pickup and that there also is less treble but more distortion than on the the other songs. Likewise, you can compare Water of Love from these recordings with What’s the Matter with you, Baby to find that the sound is fatter on the second – generally, a stock Fender Strat pickup is about as loud and bright as the neck Telecaster pickup on Water of Love, or even brighter (the metal cap on the Tele reduces treble), not so here. Another song that seem to feature the middle pickup is Lions. Mark sometimes played the intro or middle solo with the middle position (sometimes even the bridge position. There is a video of Lions live at the BBC Whistle test, and the sound is also astonishingly fat and warm here. While the DiMarzio alone sounds totally different from a Fender pickup, it also changes the in-between sound (bridge & middle, 1 & 2 ) significantly. The interesting thing here is that the 1 & 2 sound will not become fatter and warmer, but sharper and less nasal. This is because the high frequencies do not cancel themselves to that typical nasal Strat tone as they do with two identical pickups. Instead, the 6k ohms Strat pickup and the 13k DiMarzio blend differently. The sound is more like the sum of both: the warm midrange from the middle pickup plus clear treble from the bridge pickup. I see this as the formula for Sultans of Swing on the first CD. The sound on this song is noticably different from most others of the first album. I assume he plays the 1961 Strat (he calls it his Sultans Strat…) on Sultans, and possibly the maple neck with its original pickguard (probably with three Fender vintage pickups) on most other songs ( This makes sense as he favoured this guitar on the previous tour with the Talking Heads directly before recording the first album). On all 1978 pictures and videos after the recording of the album, we see him with the maple neck Strat which then has the 1961 pickguard of the rosewood Strat (with the DiMarzio), until in October 1978 he plays the rosewood 1961 Strat, with its own 1961 pickguard again, and the DiMarzio now in the neck position. The 1 & 2 sound of Sultans of Swing (first album) and on all live recordings (e.g. Live at the BBC) after the album and before October 1978 feature the DiMarzio FS-1 in the middle position. After October 1978, the DiMarzio moved to the neck position and the 1 & 2 sound became “normal” then (compare e.g. the Rotterdam 1978 bootleg). I myself already found out that the sound of the DiMarzio in the neck position plus the Fender in the middle (3 & 4 position) is similar to the Sultans sound so that I used this for the Puresolo competition some time ago. With the DiMarzio in the middle and a stock Fender at the bridge, it sounds even more original to me. What we ideally need is a pickup that can be switched from vintage sound to DiMarzio sound, to put this one in the middle and the neck position. Then we can get all sounds mentioned before. Dreaming? No, this pickup already exists – the VFS-1, which I designed myself exactly for this purpose (this Youtube video compares it to a vintage pickup and to the DiMarzio pickup. The VFS-1 is a tapped pickup (two different sounds switchable) made to my specs exclusively for me by Germany’s high-quality pickup guru Harry Haeussel. I have been offering it with the loaded Schecter-style pickguards for some time now, as it is also ideal to get the Alchemy sounds without loosing the option for fatter sounds and the 26 sound combinations of the three mini switches on a Schecter vintage pickguard. I also recommended it for the neck position to get the DiMarzio sound or the vintage sound for early Dire Straits tones. But now, with the DiMarzio FS-1 in the middle and its effect on the 1 & 2 sound, it really becomes the ultimate sound tool. Without the three mini switches (with up, off, down positions each) the two sounds of a VFS-1 can be switched with e.g. a push/pull poti. Note that you can wire the push/pull switch as you want to make the fat or the thinner sound the “default” sound with the poti pushed in. Pulling it will enable the other sound then. I am official DiMarzio dealer and offer the FS-1 brandnew at the hottest price. So if you read about it here and feel the urge to get one, you can support this site by buying it here instead of somewhere else. How close is the VFS-1 Pickup to the Original Fender Vintage and the DiMarzio FS-1? the truh is finally revealed ! congratulations Ingo for reaching the holy grail ! a question that might be stupid, but even if I know that playing near the bridge sounds acoustically different from playing near the neck, does a pickup would sound “exactly” the same in neck position or in middle position ? so if he changed the FS1 position, The difference would be only in PU combinations ? but we should hear “almost” the same sound when only one PU is used ? whatever his position on the pickguard ? Or am I mistaken ? if so why is the sound “warmer” when it’s in neck postion (late 78) than when it’s in middle position (e.g. barbarella, if it is the same pickup ? Does it come from a different wiring ? many thanks and bravo again ! Of course a pickup sounds different in each position. The original Strat design has three identical pickups, they sound different because of the position ONLY ! The FS-1 sounds fatter, in the middle you have a fat middle PU sound, at the neck a fat neck PU sound, both sounds are different, just like two identical Fender PUs will sound different at these positions. From late 78 on, the “warm” sound was in the neck position, before in the middle. At position bridge & middle, the sound becomes different again with the FS-1 being involved (FS-1 in the middle) . If the FS-1 is at the neck, the middle & neck sound becomes different (but Mark rarely played this combination). The FS-1 at the neck will sound as fat at it does in the middle. if they are identical, what makes the difference in sound ? you say the position ONLY. you mean the position on the pickguard ? so it would mean that only few cms change the sound ? Of course I hear a slighty difference when I play near the bridge or near rhe neck on an acoustic guitar, but not THAT different. the difference I hear between a neck PU and a middle PU is more obvious : the frequencies are different. So if the PU is identical, what makes this difference ? the wiring ? I am very surprised because I always thought that each PU was designed for one position. I mean if you buy a PU set, isn’t there an indication to put that PU on that position, or you do like you want ? It is in fact just the position. Fender used three identical pickups for decades, I think in the early 80ies they used a hotter bridge pickup in some models (e.g The Strat) for the first time. Those calibrated sets are a rather new idea. Strat pickups were always identical but had differences due to winding tolerance, they might range from something like 5.7 to 6.3 kOhms. Putting a slightly hotter pickup in the bridge position and the weakest to the neck results in a slightly more “balanced” set, that’s all. If you take any vintage Strat, it is pure random whether the bridge pickup is the hottest or the weakest, or whatever. I always thought the Sultans studio sound sounded more like the middle PU than bridge/middle. Maybe your theory is right, Ingo, but could it also be that middle PU simply was adjusted higher? To achieve that typical Strat “quack” the middle PU needs to be a bit lower than the bridge (or neck for the middle/neck combination). But I guess a more powerful middle PU would make it more dominant even if it is adjusted lower and therefore the “quack” disappears a bit. This sounds very interesting. To me it sounds more like middle but at times position 4. Perhaps because of chrous? Another option is a weak bridge pickup with its own volume knob or lower height. I could never really nail the sound this way. At 2.32 you’ll see the “Sultans” Strat pickups as close as can get! The middle pickup is different (FS1 i presume) much more staggered than the (Fender) pickups. Weirdly enough the middle pickup looks much more worn than the bridge and neck pickup. No, it seems he swapped middle and neck pickups in late 1978 (see article), from then on the FS-1 was in the neck position. The documentary in your link is from early 1980, the live footage from december 1979. Hi Ingo !Congratulations, great job ! I was looking at the sultans loaded pickguard you offer, and I’have notice that the VFS-1 middle pickup is different from the others : The red and the black wires are inverted. Why ? You say the three pickups of a stratocaster are the same. Thank you for your time.